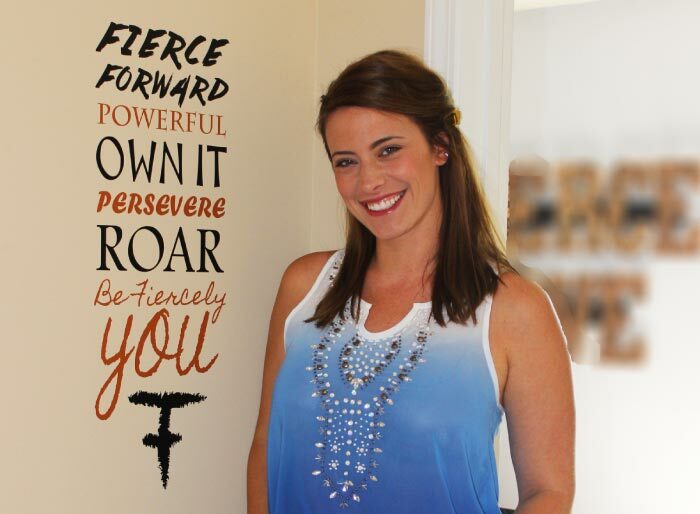 We developed this fierce design with Fierce Forward founder Ashley Johns. She’s a personal coach, trainer, speaker, and designer of fabulous body armour to encourage and motivate you to reach higher every day. Watch the video below as she describes the meaning behind the words of this unique design. Power up your life with a “Fierce Forward” wall decal that celebrates YOU! This inspiring mantra will fuel and fire you up!—giving you the needed boost to start each morning in high spirits and potent energy for the rest of the day. Fiery wall words more than pump you up like a cup of hot, steaming, strong brewed coffee. 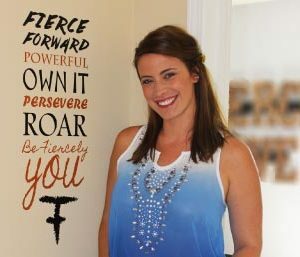 Packed with a strong and dynamic message that grips the mind, body and spirit—this “Fierce Forward” wall decal will remind you each day of the power that lies within you. It will prompt you to tap into the unique gifts you possess that oftentimes are clouded by the negativity around us—to which we are all vulnerable. 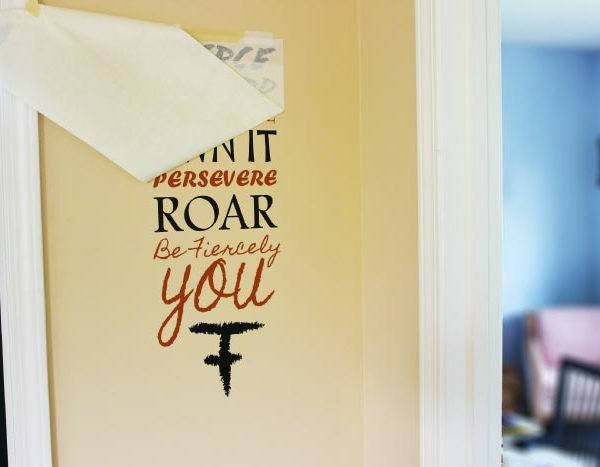 Declaring, owning, and embracing encouraging fiery words, such as those embodied in this “Fierce Forward” wall decal will more than liberate you. These will also armor you and shield you from energy-sapping people and situations. Get the most out of this invigorating wall decal by choosing a special spot in your room where you can see it as soon as you wake up. With our wide array of vivid, long lasting colors.html, you can create and preview on our decal customizer the “Fierce Forward” wall decal that will compliment your distinct, personal home style. Picking out vivid color accents is a nifty way to make your wall words stand-out, catch attention—and “talk” to you every time you walk into the room. Do you know someone who needs a breakthrough in their lives?—Someone who needs to realize their potential and greatly benefit from intense, empowering words like “Fierce Forward—Powerful—Own it—Persevere—ROAR—Be Fiercely You”? A confidence-building wall quote decal such as this will make an excellent gift for him or her. Find out on this page.php how you can purchase a gift certificate that will help make a difference in the life of a family member, friend, or co-employee. 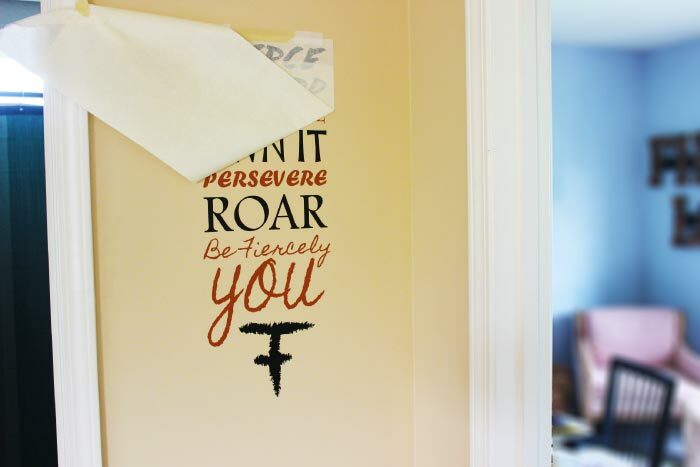 At Wisedecor, we offer you expertly-crafted custom wall decals, like our “Fierce Forward” and motivational/ wall quote decals—that not only uplift and refresh your spirits but also enhance the beauty of your home. Made from high-grade durable resins that can withstand extreme temperatures, our wall decals are your best investment in fast and affordable home decoration. These are fabulous options over wooden letterings (that may leave your wall damaged) and letter stencils (that are messy to create). Each wall decal is pre-assembled and pre-pasted on a single sheet so they’re a breeze to apply.html—no need to buy special equipment or hire an expert installer! With our custom wall decals, you get the look of fine, quality hand-painted stencils without the time and trouble. See how easy it is to transform your room in minutes by viewing our idea_gallery.html. Feast your eyes on these beautiful pictures and get exciting ideas on gorgeous color combinations and innovative ways to display your wall decal. With a wide range of lettering styles.html, versatile lettering-art/ and dozens of colors to work with, creating your ideal custom wall decal becomes virtually effortless. However, if you feel you need assistance, a professional and highly experienced designer will be on hand to help you come up with the perfect wall decal for your living space.